What a week of fishing we had. This week, I fished with Alan Heidenrich a long time client that has fished with me for over five years and fishes with me several times a year. Alan has become part of my family and I always can’t wait for the adventures to begin each and every time. Alan is very serious about his bass fishing, with a lot of big water (offshore) experience he has given it up. He has become one of the most dedicated bass fishermen I know today. Alan also takes great pride in his own equipment with G Loomis and Shimano of all styles and also has a very good bait selection for all styles of bass fishing. weather, but we still were able to catch 17 fish on crankbaits and swim baits. Day two we spent searching the flats, we found a little spot with some schooling bass and caught over 60 on swim baits and top water baits. Day three we decided to explored around the lake, we found lots of blue gill beds and some shell crackers. So, we decided to catch some food for dinner, we caught hundreds of them on beetle spins and worms. We kept a few of the shell crackers and had a fish fry that night. As the rest of the week goes we caught lots of nice bass and battled the brim on lite tackle. As this week has it, we had lots of afternoon storms which made for some fast action at times. 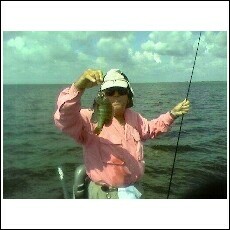 Okeechobee has been very low, so go fishing with some one who knows how to get around. The lake water is very clear and grass beds are bigger than I have seen since I was a kid. With all this rain I hope we can get to start fishing in the grass soon. Until, then the lake still has a great adventure for everyone.